In the past two decades the federal budget has tripled. However, popular wisdom to the contrary, the number of full-time civil servants has remained relatively constant. How does the government manage? 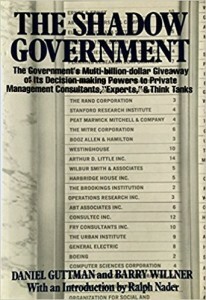 In keeping with the American ethos that private is better than public, a large part of the business of government has been contracted out to accounting firms, think tanks, management consultants, and industrial corporations like McKinsey and Co., Peat, Marwick, Mitchell, and Co., the Stanford Research Institute, the RAND Corporation, Booz, Allen, and Hamilton, Westinghouse, and the Brookings Institution, among many others. The contractors do not merely build hardware and carry out a myriad of mundane tasks. They increasingly perform the functions of government itself, albeit in the guise of private efficiency and disinterested expertise, without accountability to the public. They make and implement policy recommendations, staff and restructure government agencies, reorganize railroads and hospitals, and produce the findings that allocate the spending of the federal budget dollar. What is their track record? How well is the public interest served by the burgeoning and costly private bureaucracy which government contracting has spawned? Is it proper to delegate public affairs to a shadow government of private, corporate, and governmental constituents? These are the questions at the core of this important study, which was prepared for Ralph Nader’s Center for Study of Responsive Law.